Join the discussion on our forums! Come discuss Cybertech Chip over in our dedicated Cybertech Chip discussion topic. Just started playing this in midrange hunter and it is really fun. I wonder how it will be in ROS. It's like infest and spirt echo. This card seems good with unleash. You need probably at least 3 minons to break even and 4 or more to get good value off this card. I'd say this is somewhere between playable and bad. It is quite slow and requires either a lead on board or unleash. After I complained about the art of some cards from Boomsday, I must admit this card looks really good! I like the combination of the creepy looking scientist and the funny looking huffer. 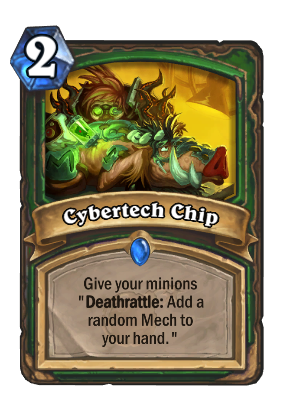 Way rather just add a solid mech to my deck and not pay 2 mana to get random one plus risking getting my deathrattle minion silenced. Seams to me like this is dust. Could get a lot of value with this and Unleash the Hounds. Although Infest didn't really see any play. We'll have to see what all the mechs in this expac look like. Like I said. We'll have to see what all the mechs in this expac look like. Depends on hunter synergies for mechs... can be a nice refill. Guys,i want you to understand the power of this card properly.For example,you play a agro deck have lots of minions,ur hand almost empty,play this and end turn.If the opponent casts a flamestri,,,,erhm aoe,you will still be safe cuz ur hand will be filled with mechs which probably in most of the cases will synergize and in the worst case you still have cards in hand and ur not forced to concede once u board and hand is empty cuz this card is the back up for every aggro hunter.2-3 stars in other decks,5 stars in aggro. Infest, but instead of Beasts it's Mechs. While I liked Infest, I don;t know a ton of people who used it and Hunter has way better Beast Synergy than they do Mech synergy (at least for the moment) so I don't see this being a popular card. tbf, Infest was 50% more expensive. Too slow for Hunter. It will see as much play as Spirit Echo or Stampede (not at all). Could be nice to get it from Rhok'delar. Is that a Robo-Huffer in that art? And would that be called a Cyboar? Sort of refill for aggressive hunter decks but until we see some early game mechs to support it it might be good only in Wild.